1)Is the water temperature cold? At lower water temperatures, some generators can get lower salt readings. 2)A high TDS (Total Dissolved Solids) level from minerals OTHER than salt can sometimes cause the salt level reading to be incorrect. Some sensors work by the electrolysis reading and high levels of minerals can cause a higher electrolysis reading. Salt itself DOES increase TDS level. 3A)Does salt sensor need cleaning?...usually part of the generator cell,but sometimes separate,these sensors need to be acid washed occasionally. 4)Do you have a leak?...if you have a leak and an automatic pool refill,you may be losing salt and replacing with regular water. 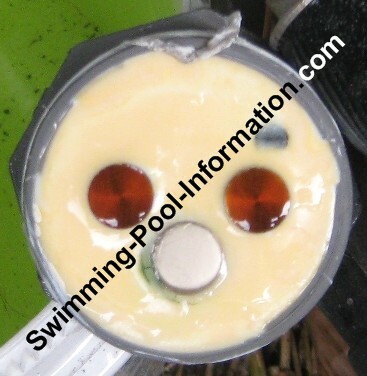 5)Rain - after a big rain,the pool may fill to overflow and dilute salt level.Taking a sample to pool store or testing with salt strips can give you a confirmation - but salt strips can be inaccurate, especially if old. 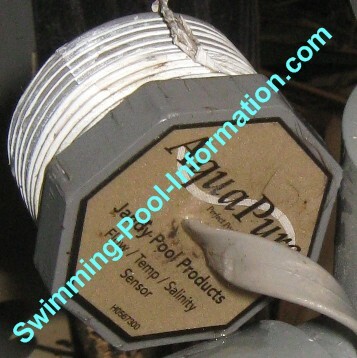 The Jandy Aquapure sensor shown above top and the sensor or water facing side shown right after soaking in an acid solution. This sensor provides temperature,salinity,and flow readings too. These sensors can give incorrect readings if dirty or scaled. Many generators have a "service cell" light or prompt - this usually means check cell for cleaning. It does NOT necessarily mean something is wrong...just means you need to check cell and reset control. 1A)Sometimes these are on a timed basis like after so many hours of chlorine production. After many hours of operation,you may get calcium build up on the titanium plates and this must be removed usually by acid washing cell. The easiest way to acid wash cell is to get a male capped plug and install on one end of cell so you can pour a water/acid solution into cell like a cup. When the water stops fizzing,the calcium is gone. Some manufacturers recommend using a wooden or plastic scraper instead of acid to prolong plate life - in any case,NEVER use a metal tool such as screwdriver or knife to remove calcium. 2)You may have debris in cell blocking water flow or blocking electrical current from flowing through plates. 3)Your water may have a high TDS reading from minerals other than salt such as calcium. If you are having to clean cell too often,it may be time to drain and refill pool. "Low Flow" or "No Flow"
This error is caused by the flow switch which can be part of the chlorine production cell (Such as the Pentair Intellichlor shown above) or a separate device. 2)Is your pump basket or skimmer basket full? 3)Is the flow switch defective? 4)If you have a non-mechanical flow switch (no moving parts) such as the Jandy AquaPure sensor,they may need acid washing too just like a cell. 5)If you have multi speed pump,generator may not work on the lower speeds (because the lower speed may not activate flow switch). 1)Is your cyanuric acid (conditioner or stabilizer)level too low? Conditioner helps keep sun rays from degrading chlorine. 60-80 ppm ideal conditioner level. 4)Is your auto fill running continuously and diluting chlorine/stabilizer? 5)If you have multi-speed pump,your generator may not work on low speed - you may need more hours on high speed. 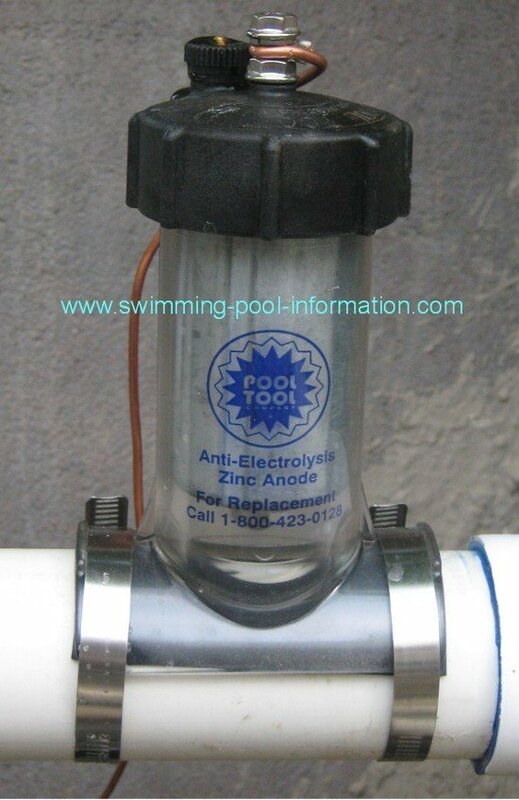 Electrolysis from cell can slowly attack metal surfaces such as your pool light,stainless steel filter,copper heat exchanger,or other metals such as some automatic cleaner parts. It protects metals in your pool by easily giving up its ions to electrolysis in the water caused by the current from the salt generator cell. For this reason,it is known as a "sacrificial zinc anode"....as an additional benefit,zinc works in a synergistic mode with chlorine to make sparkling algae free water! Note:the copper wire going to the top of unit is connected to the bonding wire..